Most biologists and life sciences professionals would agree that we are now passing through the most active phase of the science of genetics. Even before we began sequencing the human and other genomes, genetics had established in a number of areas, particularly medicine and health. Since the discovery of chromosomes and universal acceptance of the principles of Mendelian and complex genetics, the practice of clinical medicine and public health went through major changes leading to acceptance of medical (clinical) genetics and diagnostic laboratory genetics as the integral component of any tertiary medical establishment. In addition, teaching and research in medical (clinical) genetics was incorporated to ensure evidence-based approaches to medical and health applications of genetics. Most specialist medical and healthcare providers acknowledged the importance of applied and translational genetics in respective specialist practices, notably in pediatrics, neurology, ophthalmology, oncology and lately in cardiology. This is evident from a number of books, monographs and journals dedicated to many specialist clinical and applied biology fields. Since the completion of the human genome project and sequencing of the human genome, the focus rapidly shifted from genetics alone to wider field of genomics. With major rapid advances in genomic technologies (array comparative genomic hybridization, next generation sequencing (NGS) multi-gene diagnostic panels, whole exome sequencing and whole genome sequencing) it is now possible to look at the genome level for explanation(s) in a number of clinical situations empowering the clinician for making precise diagnosis and managing the condition in a more comprehensive manner. Cardiologists worldwide are now aware of the power of genetic and genomic diagnosis in dealing with wide ranging clinical cardiovascular conditions, particularly inherited or familial nature. The impact of this recent specialist discipline is evident in critical areas of clinical cardiology in dealing with acute events including sudden cardiac (arrhythmic) death syndrome, particularly the increasing utility of targeted multi-gene NGS panels in clinical and pathology (for example molecular autopsy) services. The incorporation of applied and translational genetics and genomics in clinical practice and wider healthcare is expected to contribute in dealing with many new challenges that face the medical and health professions. This is evident from extended life expectancy leading to an unprecedented growth in the aging population, with the accompanying rising burden of aging-associated cardiovascular disorders. We have now enormous data and much improved understanding on how genomic variation may predispose to common or complex forms of cardiovascular diseases (coronary artery disease, hypertension, chronic heart failure, atrial fibrillation) in the community. Delineation of the many rare genetic inherited cardiovascular conditions (ICCs) and identification of specific disease causing gene mutations and variants provide unique pathogenic insights into these diseases. The sequential steps in the molecular origins of cardiovascular syndromes are beginning to unfold, revealing the stunning complexities involved in the molecular bases of disease. We are beginning to understand how genetic and genomic factors interact with environmental or life-style factors over an entire lifetime to pattern and remodel function at the molecular, cellular, tissue, and organ levels and to ultimately manifest as subclinical or clinical cardiovascular disease. Many clinicians practicing cardiovascular medicine and surgery now accept the clinical importance of the molecular phenotyping of cardiovascular diseases, however, recognizing that the clinical phenotyping would remain mandatory. In addition, completely new phenotyping tools, such as molecular imaging and chemical profiling of patient-derived cells, are on the horizon. Over the last 20 years, the field of clinical cardiovascular genetics and genomics has now established as reflected in specialist units in major tertiary healthcare institutions. 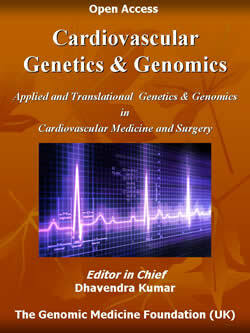 There are now books and dedicated new bio-medical journals available focused on cardiovascular genetics encompassing specific issues related to wide ranging inherited cardiovascular conditions. 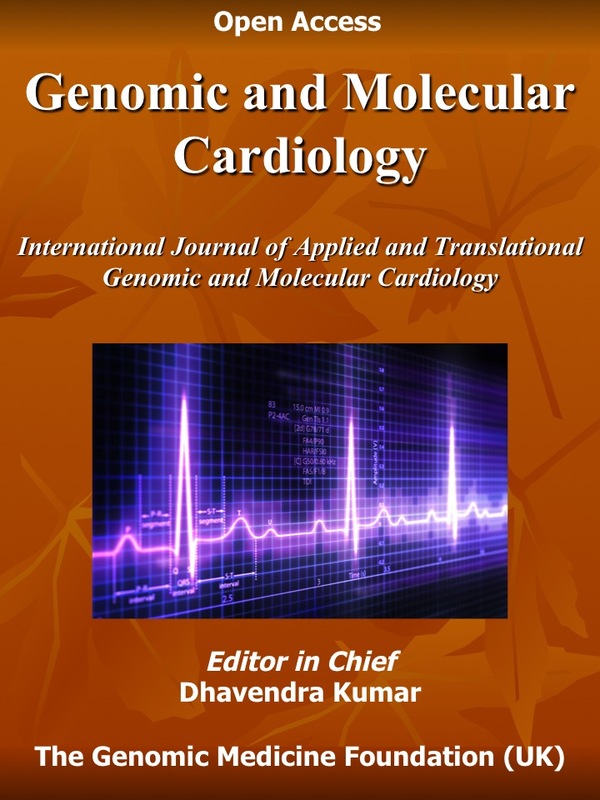 ‘Cardiovascular Genetics and Genomics’ is a new open-access journal publishing original research, meta analyses, reviews, case commentaries and updates on recent developments focusing on genetic and genomic aspects of wide range of cardiovascular conditions. The journal particularly focuses on delineation of the clinical phenotypes, new genes and variants, genotype-phenotype correlations, basic and clinically applied molecular genetics, next generation sequencing and new therapeutic developments (drugs & devices). The original cardiovascular research will highlight the omics family- proteomics, metabolomics, functional genomics and systems biology – as well as clinical trials in the burgeoning field of pharmacogenomics related to cardiovascular medicine. The journal also features current and comprehensive reviews in the areas of recent advances in cardiovascular development, Mendelian cardiovascular conditions, new diagnostic and therapeutic progress, and controversies in cardiovascular genetics. A dedicated news section summarizes the new developments in the field, highlighting articles likely to impact the management of cardiovascular disorders. Other features include clinical case reports and studies, book reviews, and letters to the editor. All manuscripts are submitted on line and should follow the usual format and include: the title, authors, institute affiliations, name/address of the corresponding author, selection of search engine key words (not more than 10), name/ address of relevant ethical approval authority, declaration on conflict of interest, statement on commercial/ financial benefits and copyright authorization for any illustrations, tables or part of the text included in the manuscript. References should be cited in the text with author and year; use suffix et al for more than 2 authors in the reference cited. All references should be listed in alphabetical order. Name of the soft ware reference manager should be indicated in the manuscript. As per journal policy, all manuscripts are independently peer-reviewed and final decision is made by the editor in chief reflecting views of the lead- editor (usually a member of the editorial board or a guest editor) and external reviewers. All accepted manuscripts are published (online and print) subject to copyright agreement with the publishers (see below). The journal is open-access and a charge is applicable. The tariff is available on request and specific charge will be advised on acceptance of the manuscript. However, the open access charge could be waived in exceptional circumstances, for example an invited review or commentary authorized by the editor in chief. The open access charge may also be waived or discounted on voluntary and for an individual publication. All paid or waived open-access publications would be made available to all registered readers. Any reader may access the paper or article subject to a small downloading fee advised at the time of consumer registration. The time required for moving research findings from “bench to bedside” is decreasing exponentially with the growth of applied and translational genomic studies inspired by large number of studies worldwide. All these developments and efforts are welcome and society has huge expectations, particularly the personalized healthcare. Based on past experiences in clinical genetics, new genetic and genomic advances invariably raise societal and professional concerns on wide ranging ethical, legal, and social issues that must be confronted by the cardiology community together with patients, ethicists, and lawyers. The costs of personalized medicine, including refined diagnosis and personalized therapies, would be required to match with anticipated improved outcomes. It is important to remember that the ultimate delivery of personalized health care rests on the shoulders of the clinicians who interface directly with patients. ‘Cardiovascular Genetics and Genomics’ is published by The Genomic Medicine Foundation (UK) Ltd, a not-for-profit company registered in England and Wales (Registered Number 8749919). The publisher holds all legal rights and acquires all financial or any other benefits of any published material in the journal. The reader may refer to www.genomicmedicine.org for further information on the Foundation and the new Journal. The Global Alliance for Genomics and Health (Global Alliance) was formed to help accelerate the potential of genomic medicine to advance human health. It brings together over 220 leading institutions working in healthcare, research, disease advocacy, life science, and information technology. The partners in the Global Alliance are working together to create a common framework of harmonized approaches to enable the responsible, voluntary, and secure sharing of genomic and clinical data. The Global Alliance for Genomics and Health (Global Alliance) is an international coalition, dedicated to improving human health by maximizing the potential of genomic medicine through effective and responsible data sharing. The promise of genomic data to revolutionize biology and medicine depends critically on our ability to make comparisons across millions of human genome sequences, but this requires coordination across organizations, methods, diseases, and even countries. The members of the Global Alliance for Genomics and Health are working together to create interoperable approaches and catalyze initiatives that will help unlock the great potential of genomic data. Since its formation in 2013, the Global Alliance for Genomics and Health is leading the way to enable genomic and clinical data sharing. The Alliance’s Working Groups are producing high-impact deliverables to ensure such responsible sharing is possible, such as developing a Framework for Data Sharing to guide governance and research and a Genomics API to allow for the interoperable exchange of data. The Working Groups are also catalyzing key collaborative projects that aim to share real-world data, such as Matchmaker Exchange, Beacon Project, and BRCA Challenge.